Since it is estimated that 30% of the compressed air generated in Ireland and the U.K. is wasted through leakage we can carry out a leak detection survey for you. Ultrasonic leak detector for compressed air. Our leak detection surveys use ultrasonic leak detectors (also known as acoustic leak detection equipment) to identify and pin point the location of any leaks in the system. The location, nature and magnitude of each leak is recorded in a spread sheet and the leak is physically tagged with a label to aid its location for repair. 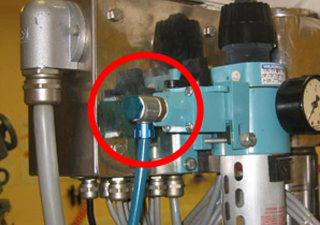 When a system drawing is available, the location of the leak is also marked on the drawing. Air leak detection and repair – tabulated summary data for savings and prioritisation. The tabulated summary also details the annual cost of the leak, which allows their rectification to be prioritised in order of the savings that will be achieved.